Best Father's day present EVAH | Watts Up With That? My kids note that I spend way too much time at my computer managing WUWT. So rather than fight it, they embraced the dark side for Father’s day. I love evil but harmless technology. TubbyCat, not so much. 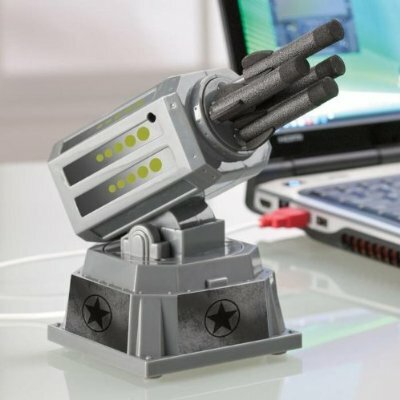 BTW, the USB Missile Launcher is harmless, it shoots nerf missiles which you control via desktop app or via remote web controls that use your webcam (or the built in one in the launcher) to help you aim. Interesting, I had this very idea years ago only with a different goal in mind. Our garden was constantly raided by starlings. After chasing them out of the garden they would simply perch on the phone wire and laugh at me. I thought at the time that I would like to develop a .22 rifle with a servo mechanism and a webcam through a scope. I could sit inside and aim with a trackball and pick the starlings off at my leisure. Just check the wide angle cam every once in a while and if there were any starlings on the wire, plink them off. Never did build it, but it was a nice fantasy when they got into the garden. My cat hates it when I type. She also prefers that if I must I type I wear nice soft sweats and not get dressed up to go out. Like my kids she is always worried I do not understand my essential role in life. I don’t suppose I do. crosspatch: Bolt the plinker to the wire. But you lose the fun of aiming. With regards to the BB gun and cats. “Two pumps on the rump” usually does it. For the stubborn ones three usually does the trick. Use six on the birds in the tomatoes. I’ve heard it takes ten to get the attention of a deer. Shame on you…poor kitty. lol. Funny as all get out. I want one. a thousand times better than a tie or slippers!! This one is for the kids age 5 to 70. Nerf darts (available @ Wmart in packs of ~ 10 to 20ea) plus ~20″ lengths of 1/2 in pvc pipe. It’s blowgun city! Sometimes even the cats love it. My beagle has a thing about… his favorite thing is cats for target practice… he will even throw them up in the air for me! Who needs to spend money on paper and clay targets when cats are free? But at least one was seriously pissed off. I had an old coil from a VW Rabbit and wired that to my bird feeder that fed more squirrels than birds. First a bench power supply, then with a Heathkit CD ignition kit that didn’t precharge the coil when the points closed. It didn’t save me any bird seed, but boy, did I have some paranoid squirrels! I know a way to rectify that. Happy Father’s Day, Anthony and all! Great gift BTW! Careful there. Cats have a perfect sense of timing when it comes to revenge – and it is often a complex scheme involving a dog taking the blame. Hey! A Rag Doll. We have two. They’ll forgive anything if you give them a belly rub. H.R. . . . you’ve never met my sister’s rag doll. So mean we had to put it on prozac to even allow it in the same room as the nieces and nephews. No kidding. Modify it to shoot paintballs. funny but PETA would not approve. RE: Use laser beams to scatter birds. During winter time here in Burnaby, BC, crows congregate in tall trees at sunrise before starting the day’s hunt for food. They cackle quite loudly and wake up the neighborhood. I have found that shinning a small laser pointer ( 640-680 nm, ca. 5 mw) on the flock perched high in a tree will cause them to disperse PDQ. I point the laser at the flock and slowly sweep the beam back and forth. Shortly after the beam hits the main body of the flock, the birds fall silent and in a blink of eye, they take flight with a furious flutter. I have read that a combination of a video camera and laser beams are used to keep birds out of blueberry orchards. Here in BC propane cannons are used to keep the birds out of the orchards and prevent them from devouring the yummy blueberries. Everybody complains about the cannons since they are in operation from sunrise to sunset when the berries are ripe. Interesting, I had this very idea years ago only with a different goal in mind. Our garden was constantly raided by starlings. After chasing them out of the garden they would simply perch on the phone wire and laugh at me. I thought at the time that I would like to develop a .22 rifle with a servo mechanism and a webcam through a scope. Not a good idea. A 0.22 has a range of about a mile. You should a 0.22 with fine birdshot. I have an AirSoft Colt-Browning 0.45 semi-automatic handgun, I shoot plastic pellets at crows walking about the backyard or on the roof. However, the range is about ca 30 feet, but it works. Just pointing the gun at them will caus them to take flight. Walk into a cornfield full of crows carrying a stick and they’ll take off in onsies and twosies and circle just out of reach as you pass by. Walk into that same cornfield carrying a shotgun and the whole flock will take off en masse and scatter into the trees until you leave. Oh Anthony – I’m still rolling on the ground in laughter with this one. Do you realize that you can do some “Pavlov” work with this? Attach a pen laser to the device. (Turned on.) Fire at TUBBY CAT. Cat will condition to firing and the laser. Thereafter, laser will make the cat jump. Not only TubbyCat must be jealous of Kenji for not having its own Concern Scientist membership, but now he is getting picked on… you should get TubbyCat a David Suzuki Foundation membership. Try thinkgeek.com for about $25. CyberGuys used to carry them, but no longer.